At Scraps N' Pieces, you can pick up this kit for FREE when you purchase at least $10 worth of product in a single transaction this month. Starting in January, the free gift will change twice per month! 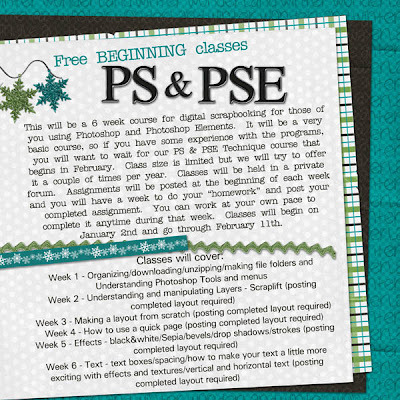 Sign up for the FREE beginning Photoshop and Photoshop Elements classes at Scraps N' Pieces! Even though it is free, class size will be limited so we can help everyone with any questions. This is a VERY VERY beginner course. It will cover all of the very basic functions of making a layout with these programs. If you don't have the program, you can download a 30 day free trial from adobe.com but make sure you download right when the class is starting so you have some time to play with it. It won't last the whole class time, but hopefully once you are into it a few weeks you will love it so much you will want to buy it anyway. Details are on the flier below. Reply to this thread to sign up for the class. 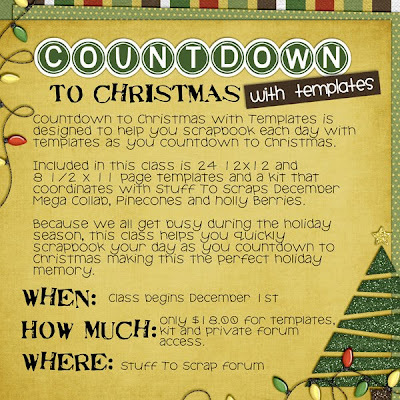 We are limiting this class to 25 participants but hope to offer the class more than once during the year. If you have a fairly basic knowledge of the program, you may want to wait to sign up for our Photoshop Techniques class in February and we will also be doing a designer mentoring class beginning in March. All will be FREE! And what else? Well, have you checked out the SNP blog lately or how 'bout the SNP Store Facebook page? Go. Now. See what you might be missing.